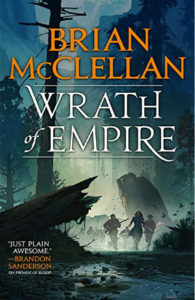 Sins of Empire, by Brian McClellan, is on sale for $2.99, likely as part of a dastardly ploy to lure readers of fine flintlock fantasy into the acquisition of Wrath of Empire when it releases on Tuesday, May 15th¹. The plot is all the more sinister given the likelihood that its victims won’t complain a bit. 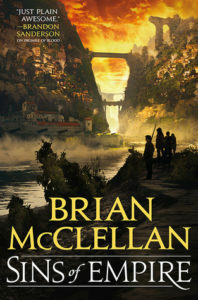 I’ve been a Brian McClellan fan ever since he debuted with Promise of Blood. That was a darn good book, and I gushed over it unashamedly². He’s gotten better at this novelist thing, however, so Sins of Empire is definitely his best writing. At least to date. I will be completely unsurprised to learn that Wrath of Empire, which I’ve only just begun³, is even better. ¹ By way of public service, the best way to support authors of things you love is to either pre-order their novels, or to purchase them the week they release. ² In that review I boldly proclaim Brian’s debut to be the best debut I’ve read. Andy Weir’s debut took my top slot just two weeks later. ³ Sometimes I get these things months early as ARCs. Sometimes I get these things a week early because the author dropped by for a chat. Mostly, though, I buy them¹. My writing group has been critiquing, and to some degree workshopping, the Death by Cliché series with their author, Bob Defendi. I’ve enjoyed the process immensely, even just reading the first full drafts. The central premise of the series is that our protagonist, a game designer named Damico, is trapped inside a pencil-and-paper RPG. The game is being run by a not-very-good GM named Carl who leans heavily on the tropes and clichés of western fantasy, which is inherently problematic since the world created by Carl and his players is now becoming populated by thinking, feeling people who have strong opinions about things like the proximity of their village to the dungeon full of monsters up in the hills. 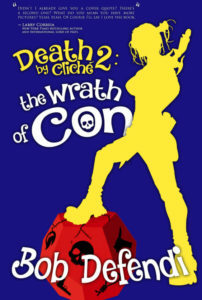 In Death by Cliché 2: The Wrath of Con, Damico learns that the RPG sessions in the real world have started up again, this time at a convention, and Carl’s plans for this adventure involve pitting the player characters against a foe who can control the weather. 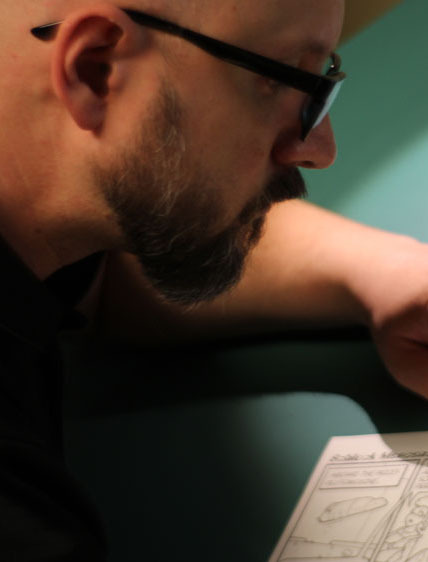 If you’ve spent much time playing tabletop RPGs you may recognize yourself, or your GM, or your fellow players in this story. Bob assures me that this is the purest of coincidence. I’ve talked about Death by Cliché before. I really like the book, and I’m a beta-reader for the sequels. It’s a game-genre dark comedy in which an RPG designer gets shot in the head and wakes up in the terribly-designed role playing game that is being run by the young man who pulled the trigger. And unlike the players at the table, when he takes damage it actually hurts. He’s not helpless, however. He is a game designer, after all, and there are artifacts in this world that can only be fully understood by him. But first he must look past the flaming brassieres, and come to grips with the fact that he cannot see his character sheet. 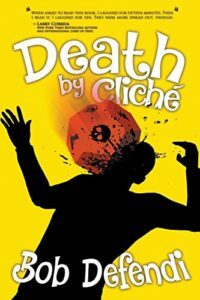 This Thursday and Friday, September 8th and 9th¹ Death by Cliché will be on sale at Amazon.com and Amazon.co.uk for just 99 cents. Act now! Pounce! Buying this book is one of the 99 funniest things you can do with a dollar². ¹I’m not in charge of these things, but I think the sale begins at midnight Eastern time Thursday morning, and closes at midnight Eastern time Friday night. YMMV. ²If you had a dark, artisanal, bottled beer for every one of those pennies we would flee before you could start singing. Matt Wallace shares my philosophy of humor: it is difficult to write, it is delightful to read, and it says important things that can’t be said any other way. 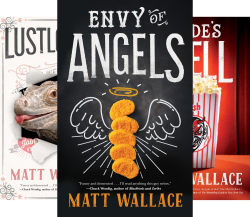 I only made it 40% of the way through @MattFnWallace‘s ENVY OF ANGELS before giving up and buying both sequels. The Sin du Jour series is urban fantasy. Our heroes work for a catering company that has been licensed and contracted to provide fancy foodstuffs for demons, elves, and other magical creatures. This may sound funny, but the series is not situation comedy. The humor is woven cleanly through the stories, giving them a voice that nicely counters the mind-bending horror implicit in feeding certain things to certain other things. The novellas move quickly, and link together in some very satisfying ways—satisfying, and funny, and delicious. With the help of his food-scientist fiancée Nikki, Matt was able to write about food in ways that made me hungry for things I couldn’t possibly afford, and in some cases couldn’t hope to digest.